In today's digital world, marketers need to find unique ways to cut through the clutter. WorkerBee.TV's video content marketing platform allows marketers to create enticing brand experiences while achieving and monetizing measurable results. The WorkerBee.TV Content Marketing Video Platform easily integrates to your website and your videos are viewable on any device. The platform comes with a content management system that simplifies the process of video creation, distribution (on your website, across social media, and through your own outreach), and client conversion and measurement. 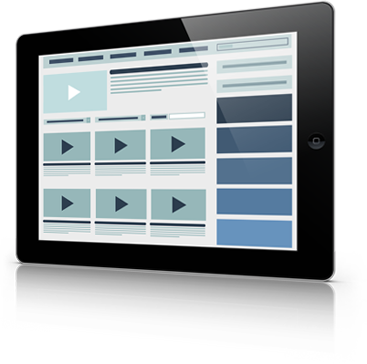 This responsive platform delivers video in both Flash and HTML5 without the need to manage separate online video players for each viewer environment. The Video Content Marketing Platform offers qualitative and quantitative feedback so you can adjust your marketing efforts accordingly and outbound marketing tools allowing you to share your video content to prospective clients, staff, and partners. 93% of B2B marketers use some form of content marketing* and 61% of consumers are more likely to buy from companies that create custom content. * This way of delivering consistent and engaging media to a targeted audience with the intent to drive a profitable relationship is no easy feat. Your content needs to be informative, educational, and inspiring. At WorkerBee.TV, we are content conversion experts. We will help you bring your brand stories to life through video, in an engaging and professional manner. Need help with filming or video creation? No problem. We have local videographers in more than 100 cities across North America. From 1 hour increments to multi-day shoots, we'll guide you every step of the way. Access our professional producers, writers, videographers, motion graphics and video editors, and web and video platform experts so your content not only captures the audience's attention, it drives conversion. From content planning, video creation, to distribution, our Content Marketing Video Platform and services guide you all the way. We'll work with you to teach you video best practices and syndication strategies to maximize engagement, SEO, and brand building. Video is the most portable medium and our platform makes it easy for you to feature and share content across all of your communication capabilities, enriching your e-newsletters, social media outreach, website, and your community. Easily post videos and playlists to your website or share them via social media. Everything is measurable; our analytics will showcase the success of your video marketing strategy, leaving no guesswork in your current and future campaigns.